Started from Chautauqua with Joel and ran the Mesa over to Bear and then up it via Fern. Fern trail conditions were mostly excellently-packed, but only a couple people had been down the West Ridge. From Bear Canyon we blazed through shin-deep snow (with Joel bonking like a champ) up to Green before descending the front. Really nice outing in all the glorious snow but with comfortable temps. Tue-AM: 1:07, 2700' ~ Green Mt. From Chautauqua, ran up and down the front with Joel. My shin was a little touchy, but the snow-packed trail was in perfect condition. Up and down the Cables. Started from the trailhead at 6am with Joel. We wanted an early start to ostensibly capture alpenglow on the Diamond, but the clouds had different ideas. Joel still got some shots with great light above treeline, but there was a ton of blowing snow and the mountain itself was completely socked in all day, so not many epic views. Joel on-sight soloed the Cables (because he wanted to shoot me from above), which was especially notable considering his oxygen-depleted state and the near-constant spindrift. Above there I endured exhausting, hip-deep trail breaking to reach the summit. Of my eight Longs summits so far this year, this one had the most snow, by far. The round-trip would've been a couple hours faster without all the camera-work. Cruised up to the flattie starting from Chautauqua and found it in surprisingly dry conditions (there were still some wet spots, but not as much as I expected) considering how much snow is still on the ground. Scrambled it in 15:05 and then slogged up to the summit of Green before descending to the base and scrambling it again in 12:25 with a 2:05 downclimb. That's the fastest I've scrambled the First since last fall, and a 40sec PR on the downclimb. Really fun morning on the hill. PM: Climbing with jLu at Animal World in Boulder Canyon. A rare afternoon mostly clipping bolts. Up and down the Cables with Joe. I had a bunch of energy this morning for some reason...part of which, I suspect, was due to the new 6mm x 35m string I had in my pack for rappeling. Which is substantially lighter than the 7.8mm cord I used to carry. Anyways, the trail was excellently packed, but when we got to treeline it was snowing fairly hard and would stay that way the entire rest of the day, sometimes snowing really hard. When we got to the Cables, the dihedral had way more snow than just two days ago, which made it the most secure-feeling it's been all winter soloing it. We didn't spend much time on the summit as a nasty wind was blowing tons of snow around (really this was the case for a lot of the day), so made quick work of the North Face before running back down to the car amidst really heavy snowfall. Of course, there was sun at the parking lot. PM: Climbing with Buzz on the 3rd and 2nd Elephant Buttresses. Got in four pitches. Sat-AM: 2:19, 4500' ~ 1st+2nd+5th Flatirons+Green Mt. Biked to Chat, then scrambled the flatties. First flatiron link-up that I've done in a while. The slab on the left side of the Pullman Car on the 2nd was really wet, but some judicious stemming got me through. The morning's sun and warm temps got to me a bit, though, and sitting on the summit of the 5th while drinking from the pothole up there I decided I didn't have the juice to tack on the 4th as well before heading to the summit of Green. I also wasn't very excited about the certain post-holing on the descent on the south side of the 5th. Up and down the Cables, solo. Moved well up to the boulderfield, picking a good line across the tundra. There was a nasty wind above treeline, but nothing atypical or unreasonable and it died almost completely except for a few gusts once I got onto the boulderfield. The Cables climb went very quickly as a bunch of snow was packed into the corner, but then I slogged for days up the rest of the north face to the summit...lots and lots of postholing/trailbreaking. The summit was exceedingly pleasant; I didn't even need to put on my puffy jacket. The downhill went very quickly. I plunged back down to the Cables in 6min, didn't even bother to get out my harness and rap cord and instead just downclimbed the whole thing in less than 5min before taking off my crampons, stripping down to only a short-sleeve t-shirt, and running back to the trailhead. The whole descent took me 0:58. PM: 1:03, 3000' ~ 1st Flatiron+Green Mt. Couldn't resist the 70F weather, so biked up to Chat for a scramble and a summit. One of those glorious outings where the legs just never really get tired, felt very strong on the uphill and descended the front back to Chat in only 21min. Wow, this turned into a really good week of mountains. I had a little scare with the shin again on Tuesday, but my avoidance of extended flat running since then seems to have kept it happy. It felt 100% today. Weeks like this get me very very excited for racing and summer and adventures in the high peaks. Just have to remain patient and not do anything silly so I can stay healthy. 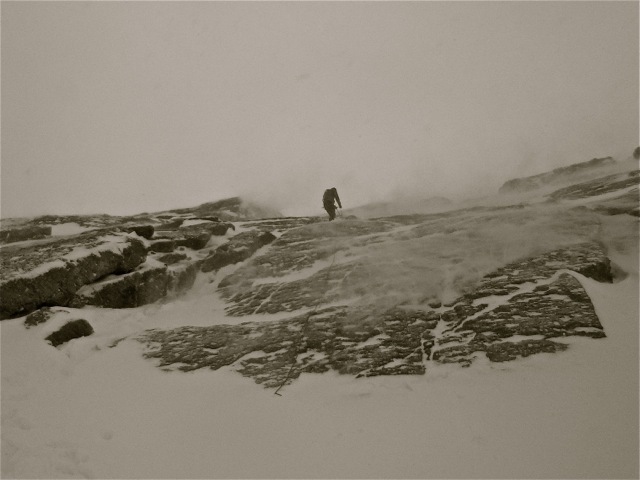 Joe rappels through spindrift on the Cables route on Longs Peak on Friday morning. Looking back toward the Twin Sisters from above treeline on Longs this morning. Crossing the Boulderfield after tagging the summit this morning. Biked to Chat, hiked up to the First, scrambled it, and hiked back down. Cold, breezy day, especially up on the rock. Just taking it easy on the shin. Exact same outing as yesterday. Bike, hike, scramble, hike, bike. Not as cold, though. Biked to Chat, hiked up and scrambled the 1st, but then instead of just hiking back down to Chat I downclimbed the 2nd, which is something I've always wanted to do as a test for linking all the flatties together as quickly as possible. It was interesting, but not something that really appeals to me aesthetically. Went up the 1st in the afternoon with Joe and Geoff. I was really just tagging along for the fun of it while Joe did the grunt work of dragging the rope up and setting up anchors for Geoff who was climbing it for the first time, on belay. Pitching it out with a rope makes you realize just how big a formation it is. Fun afternoon hanging out on the rock, though. Biked to Chat, ran to the base, scrambled it, and ran down. Which was a notable improvement in the shin after limiting myself to hiking all week. This was my 60th ascent ever of the First Flatiron, 59 of those occurring since last July. Fri-AM: 1:51, 4000' ~ 5th Flatiron & 1st Flatiron+Green Mt. Biked to Chautauqua and ran up to the base of the 5th Flatiron. There was quite a bit of snow at the base, but really well consolidated so I didn't have any issues getting on the face. I haven't been on the 5th in almost two months, so some of the sequences felt a little rusty, but the arete finish on that rock is by far the finest of any of the flatties, I think. After downclimbing, I picked my way to the top of the mountain...still haven't found a super-efficient route for that but it's getting there. After tagging the summit I ran down to the base of the 1st and then scrambled that--I was starting to feel the duration and accumulated vert of the outing by time I got to the top. Downclimbed and ran back down to Chat. Shin was pain-free, but about an hour of this was steep hiking/scrambling, not running. Sat-AM: 2:17, 3000' ~ Green Mt. 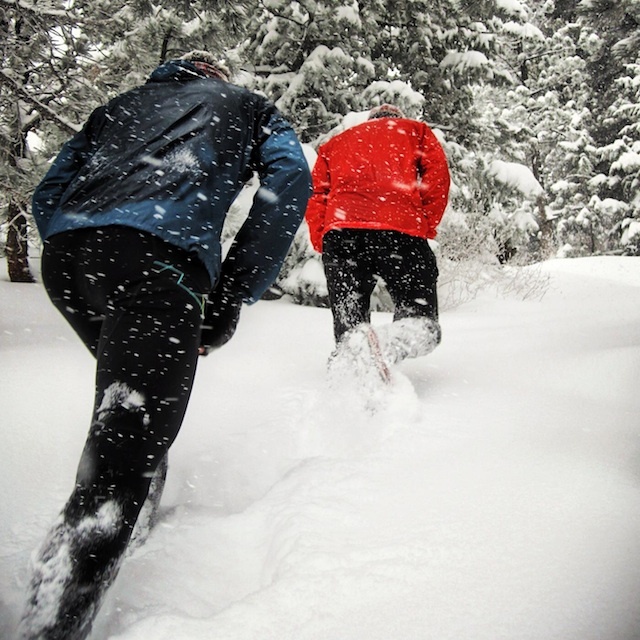 Ran from my apartment with Joel, met Jurker, and headed up to the Gregory lot in a snowstorm, where we headed up and down the front of the mountain in a ton of fresh snow. Close to knee-deep on the upper parts of the mountain. Cold and humid and snowy on the run home. Sun-AM: 1:56, 3000' ~ Green Mt. Same run as yesterday, with Joel again. Trail still had very loose footing; put in a casual effort on the uphill. I was happy with this week because I think I did a good job of managing the niggle in my shin and was able to keep getting out in the mountains without making it worse. By the end of the week it was feeling a lot better. The weekend's snow was a bit of a bummer after the extended warm weather we had before that. I definitely have spring fever. This week's shin issues have made me realize that I'm going to have to be conservative with the running for a few weeks, much like last summer where I focused on vertical and steep hiking/scrambling for a long time before the shin was strong enough to do consistent, sustained running. This is fine fitness-wise as long as my races have suitable amounts of vertical, but not so great in a proper running race (see: Leadville 100 last year). So, Transvulcania will be interesting, but given my results at Cavalls del Vent last fall (the TV field this year will have most of the same European players) I'm confident that this kind of preparation will still be effective, the most important thing being arriving at the starting line healthy. Atop the Fourth Elephant Buttress in Boulder Canyon. Photo: Jenny Jurek. On the Dome in Boulder Canyon. Photo: Jenny Jurek. Slogging up Green on Saturday with Scott and Joel. 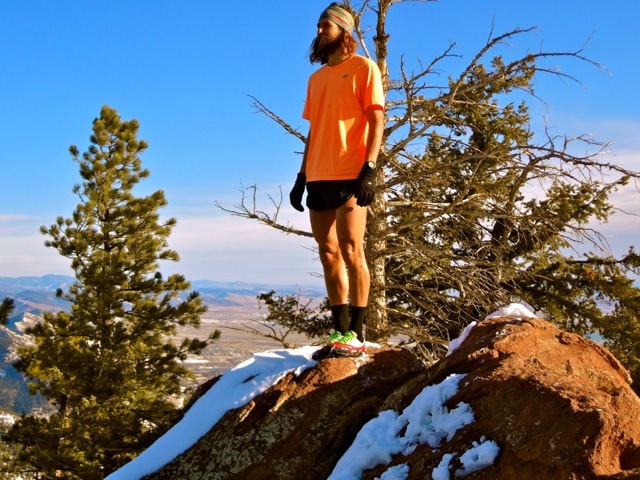 Photo: Scott Jurek. Biked to Chautauqua then ran the Mesa over to Fern. The bottom half of Fern was in really good shape but above the saddle was mostly wallowing through drifts. Trail was packed well over to Green then and I descended Greenman-Saddle Rock-Amphi in a sprightly 16:25, not really pushing it, just taking advantage of the nicely packed conditions. Afterwards, climbed a quick lap on the Dome in Boulder Canyon with Joe before the wind and Joe's understandable unwillingness to be tough again just yet made us call it a day. Biked up to Chat and cruised up and down the front of the mountain. I was testing out some new rubber on some NB protos, so stuck to the less-committing slopes of the 2nd Flatiron rather than the much more tenuous 1st Flatiron. About half-way up the mountain I ascended into a snowing cloud that I was able to escape on the run back down to Chat but by time I got back home it was snowing pretty well in town. Tue-AM: 1:56, 3000' ~ Green Mt. Woke to 3-4" of fresh snow, so ran from my doorstep up the front of Green and down Ranger-Gregory. Tired legs, definitely still adjusting to the increased volume. PM: 1:08, 3000' ~ Green Mt. From Chat, went up and down the 1st/2nd Access route. Took poles, and while they weren't needed on the exquisitely packed trail to the 1st saddle, they were nice to have in the post-holing above there. Theatrical evening scene on the summit with a setting sun shining dramatically through low-hanging cloud layers. Up and down the Cables for Longs summit #7 of 2013. On the pre-dawn drive to the trailhead the wind was blowing really hard--same in the parking lot--so I was kind of dreading the march up the hill. There was a lot of new snow below treeline so I wore crampons and took poles, which helped a bit, especially since I was breaking trail. The wind was definitely blowing up on the tundra but it wasn't impossible and once I got to the Boulderfield it wasn't bad at all. Tons of spindrift was coming down the north face, though, which made things fun, and then the summit (2:27 up) was stuck in a cloud so I didn't get any views. Of course, things warmed-up on the downhill (1:12 descent) and overall I was psyched to have gotten in a fun summit when conditions weren't seeming very good early in the morning. For most of the climb I was feeling like the altitude wasn't really affecting me, but then the last 1000' sucked as much as usual, taking the usual full 15min to get from the top of the Cables to the summit. Biked to Chat, then ran over on the Mesa and up Fern to the summit of Bear, over to the summit of Green, then down the front back to Chat. Didn't take spikes with me but the warm temps meant that my hyper-lugged 110s gripped reasonably well in the snow all morning. PM1: Climbing w/ Joe. My first time up the uber-classic Yellow Spur in Eldorado Canyon. Biked to Chat, ran up to the base and scrambled the First, downclimbed and continued on to the summit of Green in dwindling light. Turned on my headlamp for the descent. Really nice to spend basically the whole day outside from sun-up to sun-down in perfect weather. From Chautauqua, just cruised an easy lap on the First before meeting Jenny to go climbing. Moved well on the rock, but took it easy on the approach and descent, trying to be nice to my slightly sore shin. I guess you can just never assume old injuries are gone for good. PM: Climbing with Jenny. Went to the Elephant Buttresses for a couple quick ascents of the Third and Fourth Buttresses. Fun to see improvement and lead routes that I had trouble following just a couple months ago. Sat - nothing. Taking the weekend off in order to be careful with my shin. After suffering through almost 18 months of issues with it before last summer, I'm pretty wary. Sun- 0. The wind deterred me from even getting on any rock. But the shin is definitely improving. Was feeling really solid all week, with great weather the second half of the week, but then it finished off a little frustrating with an old, nagging, niggle kicking back up a bit. I have lots of experience with the shin pain, though, so am hopeful that I can treat it right and not have it jeopardize too much mountain time. It's a good reminder, though, that I need to remain patient and vigilant as I ramp up the training volume. Can't neglect any link in the chain. It is spring. 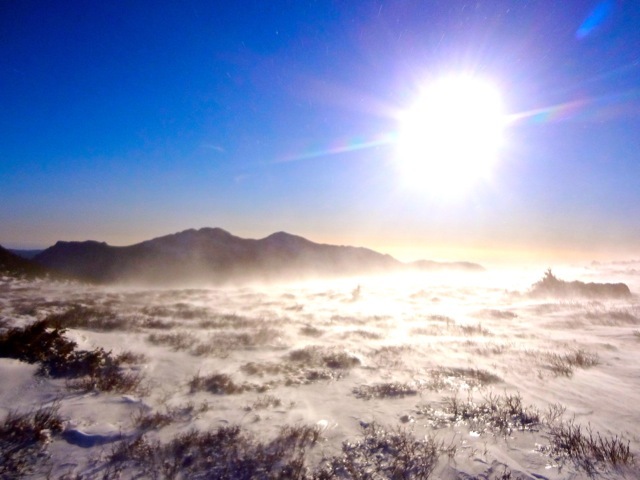 Summit of Green Mountain. Rime ice on the Diamond and the north face of Longs on Wednesday. 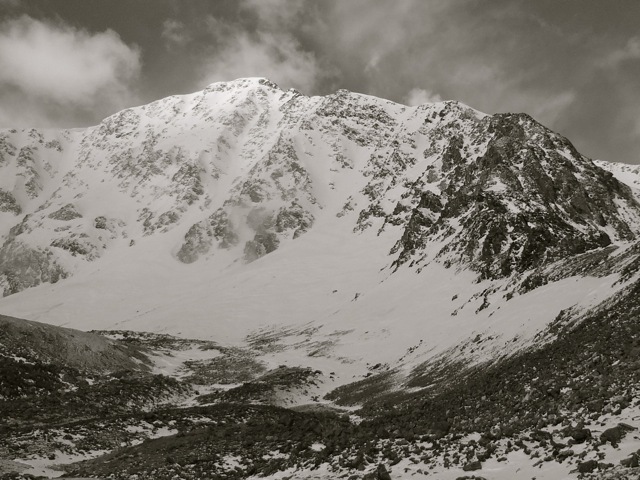 Last bit of the Yellow Spur on Thursday, Eldorado Canyon. Photo: Joe Grant. Mon-AM: 1:34, 3000' ~ Green Mt. Started from the library and ran up the front and then down Ranger to Flagstaff to Eben G. Fine and back to the library. The trails were pretty much bulletproof ice which was sort of frustrating, but my hip was 100%. Top of Green was in a cloud. Tue-AM: 1:31, 3000' ~ Green Mt. Started from the library again, but went up Gregory-Ranger and down the front. Felt good. Up and down the Cables. Really good day on the mountain. Was on the trail shortly after 7am and made the right decision to take poles this time. 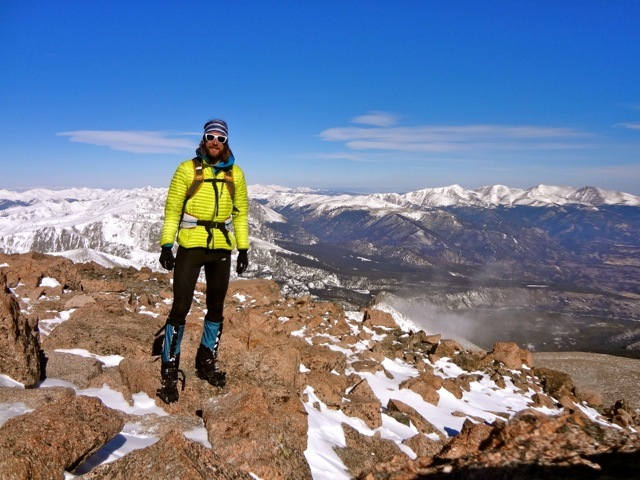 It's sort of awkward because it would be good to wear KTS crampons below treeline, then Microspikes across the tundra and Boulderfield and then back to crampons for the technical bit up and down the North Face, but I always start out in Microspikes below treeline even though they don't offer quite enough bite. Anyway. Made good time up to treeline but then lost a bunch of time wallowing around in the drifted snow right at treeline and in various spots across the tundra. I will pick a much better line next time. Only a few big gusts of wind as I came over the shoulder of Mt. Lady Washington and onto the Boulderfield and it was downright warm if you were in the sun. The climb up the Cables went really well. 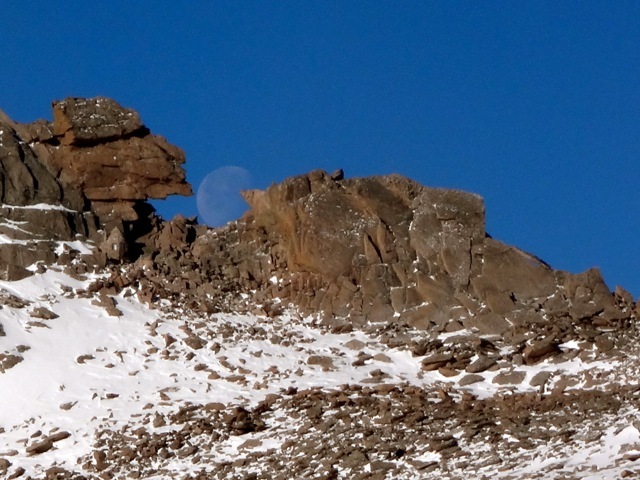 The first crux at the base of the dihedral is non-existent right now because of all the snow piled up at the base. But it was difficult wading through that. Above there I was able to feel really solid the whole way and even questioned why I brought a rope for the rappel, but I'm glad I did. No reason to go out and take unnecessary risks. Topped out after 2:32, spent a couple minutes eating a gel and taking a couple pics before heading back down. The rappel went well with the 30m rope. It leaves you a few feet short of the second eyebolt, but the angle there is mellow enough that it's not a big deal to just lean into the wall and set up the second rappel, which is quite short down to the snow apron. As I started running down the boulders below the Cables a large party of climbers started trickling uphill, which sort of surprised me. 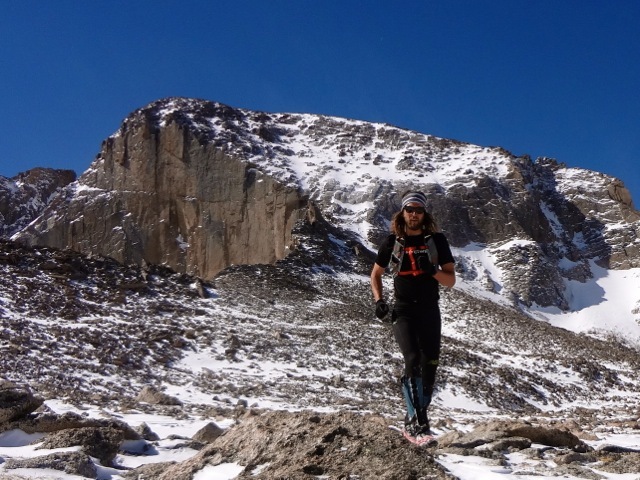 No less than four of them were wearing La Sportiva Spantiks. Which is a crazy 7000m double-boot that costs $750. Maybe they were training for something, but I was sure comfy enough in my 8oz New Balance 110 Winter's (with KTS Steel crampons). The rest of the run was uneventful but so warm that I stripped down to my short-sleeve shirt well before treeline. Was excited by the nearly +60F day, so got out for a cruiser lap on the First at sunset. 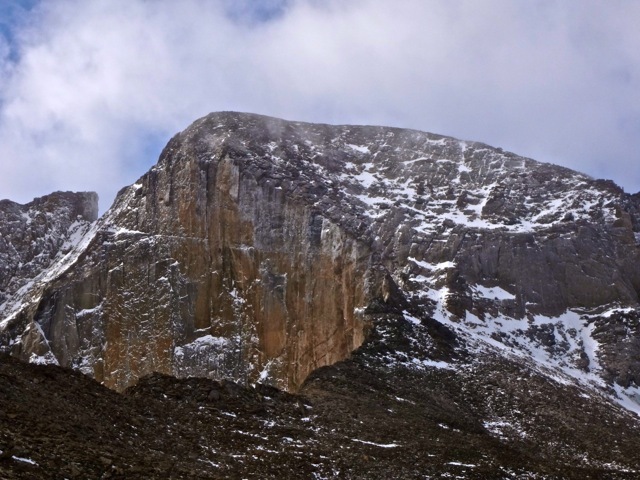 In retrospect, I probably should've waited one more day before climbing it as there ended up being a lot of water running down the face and lots of snow on ledges and in cracks. This made it a touch more adventurous than I'd bargained for in a few spots, but it worked out. Due to the wet conditions, the scramble took me a full 20min. Thu-AM: 1:48, 3000' ~ Green Mt. Met Jurker at the library and headed up Gregory-Ranger and down Greenman-Flagstaff. Lots and lots of ice. Almost too much. Nice warm morning, though. 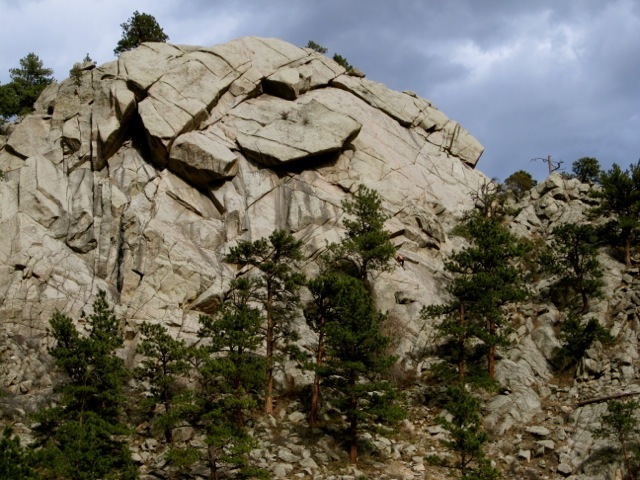 Afterwards, simul-climbed a quick lap on the Dome in Boulder Canyon with jLu to complete the Team Jurker morning. Acupuncture in the afternoon. PM: 1:16, 3000' ~ First Flatiron+Green Mt. Biked to Chat, ran up through the heinous mud and slush and ice, and scrambled the First before heading up to the top of Green right at sunset. The First was quite a bit more dry than yesterday, only a couple wet spots. Descended the front. Up and down the Cables. I wanted to get in another lap on the big mountain before the storm this weekend, and I was treated with a winter car-to-car PR and nearly perfect weather conditions. The trail below treeline was packed out pretty much perfectly and I (finally) wisely just followed the packed track up past treeline instead of trying to blaze the shortcut that was packed in earlier this winter. This got me to treeline 6min faster than usual. Across the tundra up to the Boulderfield I also did my best job yet picking an as-snowless-as-possible line and enjoyed essentially completely calm conditions before making it to Chasm View in 1:49 where I stopped to put on a couple extra layers and my crampons (the lower cardiac output of technical climbing always requires a little more insulation to stay warm). The Cables dihedral went quickly (~5min climbing time), and then I enjoyed a packed trench through most of the 3rd Class terrain to the summit, courtesy, I'm sure, of the Southern Adventist mountaineering class I ran into on Wednesday. I was at the summit at 2:14 and only took a couple minutes to hit a gel, sign the register, put on my harness, and snap a couple pics. It only took me 6min to descend back to the top of the Cables where I rappelled the first 50' (I have a 100' rope) and then I decided to just downclimb the bottom half, which felt totally secure and definitely saved me a couple of minutes. I was back at Chasm View at 2:30 total time where I removed my crampons and ran all the way back down to the trailhead sans metal traction, hitting treeline at 3:09 and completing the full descent in 1:08. Really fun morning. PM: 1:14, 3000' ~ First Flatiron+Green Mt. The rain/snow showed up later than I thought it would, so I biked up to Chat to sneak in one more lap on the First and Green Mountain. Rock was the driest it's been all week, so I cruised up it in 14min before marching through the slush to the top of the mountain. Only bummer was that when I got back down to Chat my bike had a flat, making for a long, chilly walk home. I could've run it, but I didn't want to push things after already putting in such a big day. Sat-AM: 1:58, 3000' ~ Green Mt. From my apartment up Gregory-Ranger and down the front. Started out in lightly falling snow but by time I was on the trails it was a full-on blizzard with rapidly accumulating snow. Heavy, wet, slushy spring-time snow. Which didn't help things with my super-tired legs, but good to get out and tag the summit in the winter conditions. Sun-AM: 1:55, 3000' ~ Green Mt. Ran from my doorstep, up Gregory-Ranger and down the front. The trails were packed out but generally punchy and unconsolidated, making for inefficient footing and slow times. Gorgeous morning, though. I think I can finally feel some fitness returning to my legs and lungs. It's definitely spring-time now, so my return to health is happily coinciding with my competitive juices starting to flow again. I need to start gradually building up the running legs, so will probably add a weekly long run (as opposed to a long hike/slog/scramble/14er summit) from here on out. We'll see how that goes, it's certainly been a while since that's been a regular part of my weekly regimen. Also, I've got a new post over on the UD Blog. Mt. 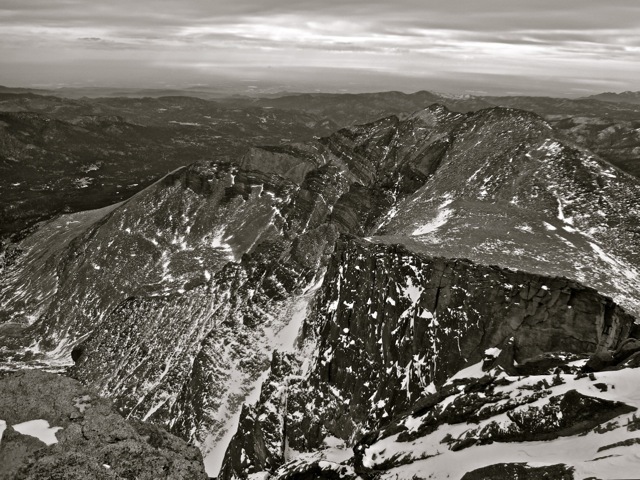 Meeker, from the summit of Longs Peak. 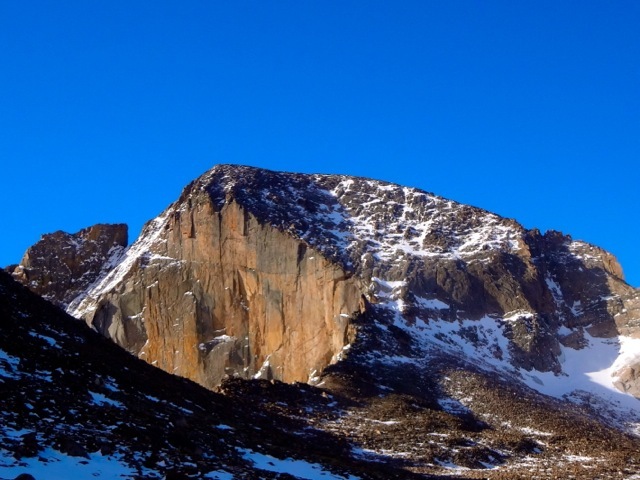 The north face of Longs pierces an azure sky on Wednesday. Summit of Longs, Wednesday. Mummy Range on the right skyline. The Longs-Arapaho traverse (L.A. Freeway) stretches out behind me. 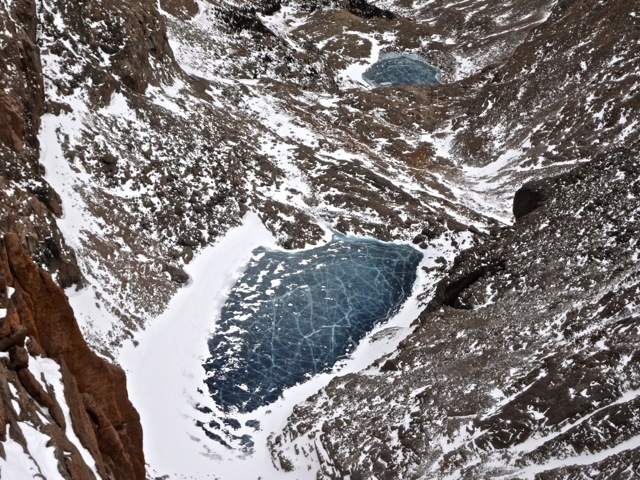 Chasm Lake and Peacock Pool 2000' below, from the summit of Longs. Mon-AM: 1:21, 2700' ~ Green Mt. From Chat, went up and down the front. Slow ascent with lots of loose footing in all the new snow. Tue-AM: 1:17, 2700' ~ Green Mt. Exact same run as yesterday except that it was dumping snow again this morning and I went up with poles, which made a big difference in uphill efficiency with the still poor footing. Got acupuncture afterwards. Wed-AM: 1:14, 2700' ~ Green Mt. Same run again but slightly better trail conditions so I climbed a couple minutes faster. Warm, sunny morning had me in a short-sleeve shirt. Oy. Long, tough day on the hill. Left the parking lot knowing it would be cold and breezy (-30F windchills), but was still hoping to get up and down via the Cables in 3h30 or so. Within 10min or so I knew I should've brought my trekking poles for uphill efficiency---the shortcuts were still covered in fresh snow and above treeline there were lots of deep drifts to wallow through---but so it goes. Once past Jim's Grove the blowing snow became pretty out of hand and I began wishing I had goggles. This only got worse once I popped over the ridge onto the Boulderfield and I eventually decided that soloing up the Cables sounded pretty sketchy in such high winds. So I headed to the Keyhole, but just past the other side a particularly obnoxious gust of wind tore my sunglasses right from my face and flung them somewhere far down the snowy slope, never to be seen again. Dammit. 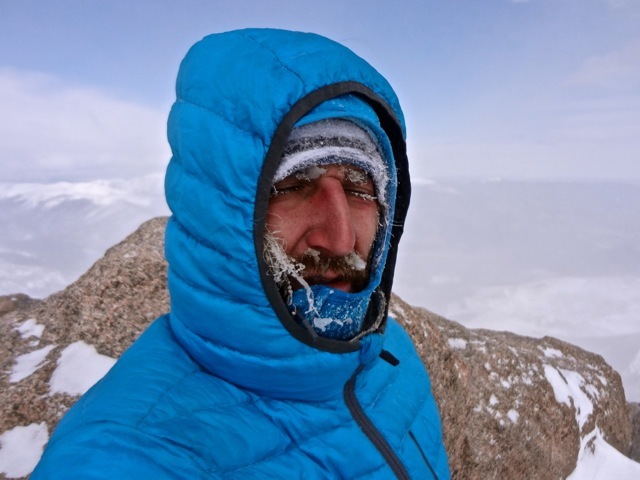 I decided to try on-sighting the Northwest Gulley, hoping that getting in the chute would shield me from the hurricane a bit, but about half-way up the spindrift was insane and it was all I could do to keep my eyes from freezing shut. I had fleeting thoughts of even completely bailing at this point, but with only ~1000' of vertical left I was loathe to give up now. So I meticulously backtracked down the 4th Class terrain to the standard Keyhole Route and took that over to the Trough and up to the Narrows and the Homestretch. The Narrows surprised me with how much snow there was in a couple spots---much more and I don't think I would've been too happy to be soloing it. 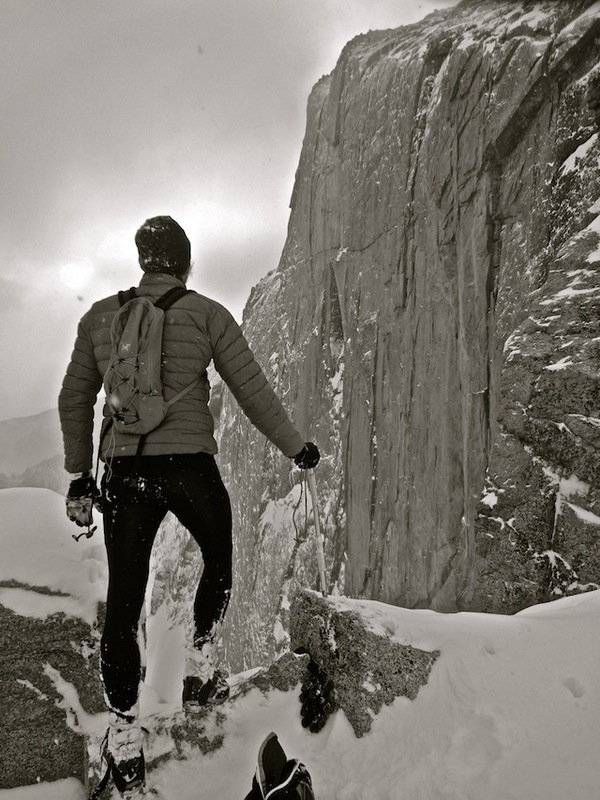 Crampons and axe were definitely mandatory, and the Homestretch was a total snow climb as well. Finally made the summit after a very hard-fought 3:28, threw on the puffy, sucked down a gel, and descended the North Face via the Cables rappel. Rappeling that line, I definitely kicked myself for not just ascending the North Face because it seemed to be oddly (relatively) sheltered from the wind there, and there was so much snow in the crux dihedral that it would've been quite easy to climb. Felt like I spent quite a bit of time bumbling with the rope and my crampons, but I finally got into a stilted rhythm stumbling my way back across the Boulderfield and down to treeline where I again wallowed around in the snow way too much looking for the easiest line down. Below treeline I finally got back on packed trail and made it back to the parking lot about two hours later than I'd planned. Oh well, any time I can stand on top of Longs, it's a good day; I love that mountain. Up Gregory-Ranger and down the front, from Chautauqua. Legs were tired from yesterday but it felt good to get out and do some running on the way up instead of the hiking that typically occurs when going up the front. Trail conditions are really good (packed snow) right now except for all the drifting from last night. 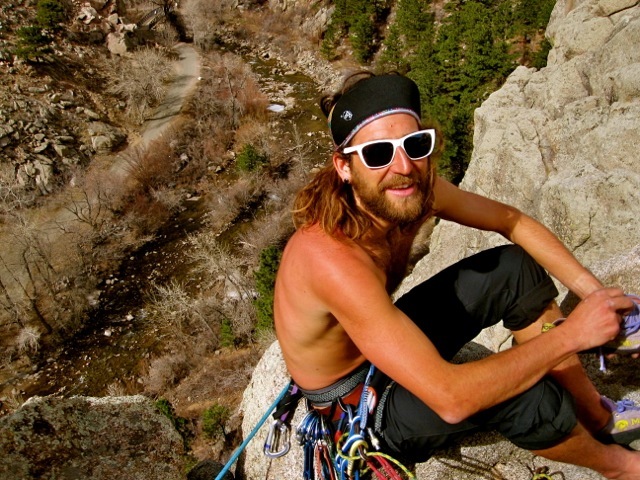 Really debated on whether we should pay to get into Eldo if there wasn't going to be anything dry to climb. Despite there still being a ton of snow almost everywhere (including the 500' of vert on the approach) the rock itself was 99% dry. Dakota led up the first long pitch of the Green Spur, and then from the Red Ledge we went up pitches 3-6 of Rewritten. Another stellar day in the canyon. A little chilly on the rock, but not bad. Really nice run from Chat up the back and down the front. Trail is in great snow shape. 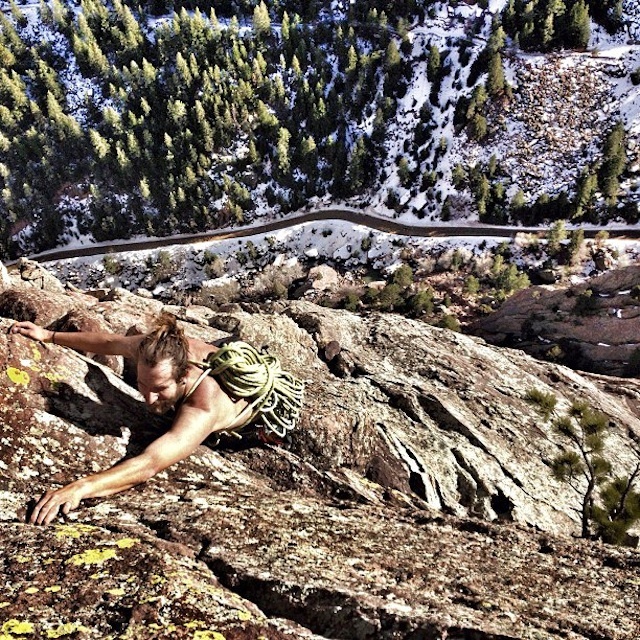 PM: 500', Climbing in Eldo with Jon and Jenny. Parked at Bakerville and ran up the road to the trailhead. 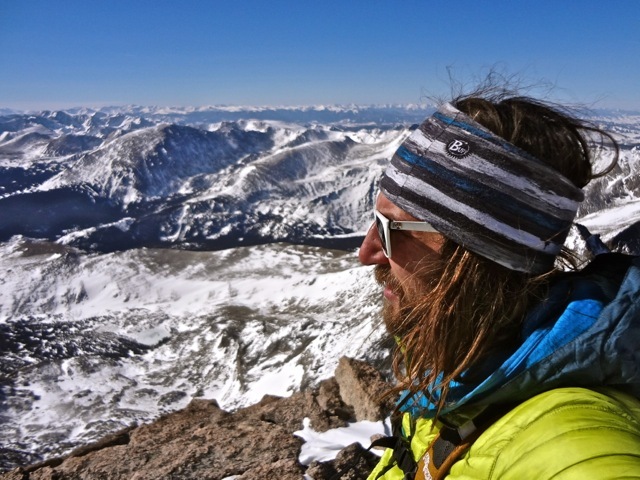 Took Kelso Ridge up Torreys before tagging Grays and heading back down. The main trail was decently packed but heavily drifted in some spots. Once I was on the ridge I enjoyed a totally unexpected reprieve from the wind until I was right below the summit. The traverse between the two peaks was super windy and by far the most unpleasant part of the day. Didn't see anyone else out there until I was running back down the road to the highway. First completely flat miles I've done in a long time, so it was nice to start working those back in. Hip was 100% and there was loads of pizza and beer afterwards, so it was a fun evening. It feels like I've finally really turned the corner with my hip flexor. I've run every day for three full weeks now, and my pair of forays into the high country last week have registered zero negative effects, so things are really looking up. Having said that, I decided over a week ago to not make the trip down to New Zealand for the Tarawera 100K in 10 days, and despite my hip showing significant improvement I know it was the right choice. I've done no long runs of any type since December and don't have any desire to travel all that way to muddle through 62 miles with poor fitness and a very likely chance of re-injuring myself. Depending on how things go over the next few weeks, I could see myself joining the fun at Lake Sonoma next month, however. We'll see. Transvulcania is a race that I'm very excited about and I don't want to jeopardize my preparation for that...or all the necessary groundwork that needs to be laid now in order to reach the goals I have for this summer. 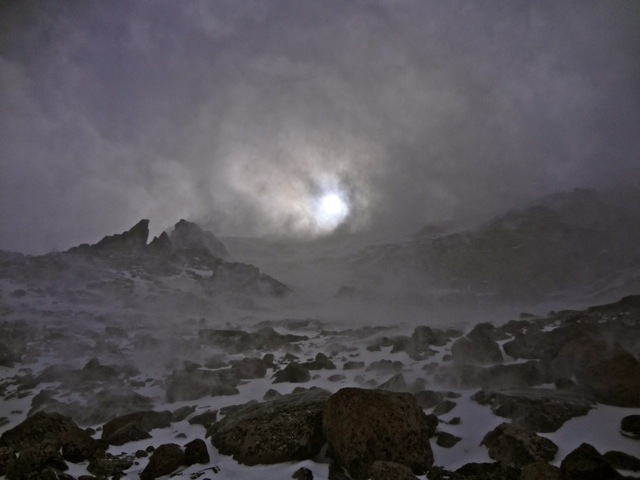 Unpleasant conditions on Longs last Thursday. Looking up the North Face, which I just rappelled. Torreys Peak on Sunday. 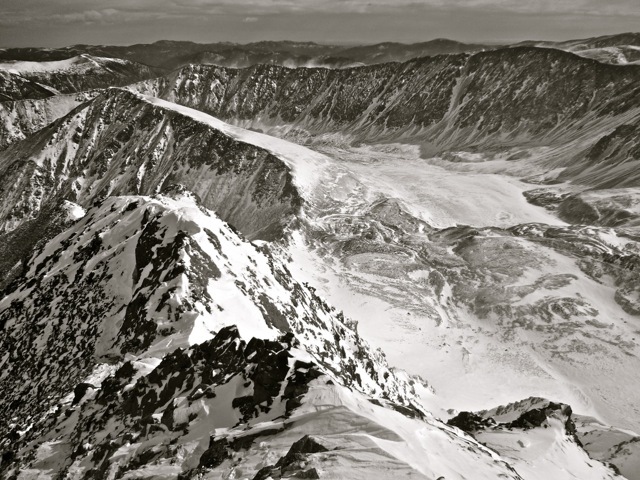 Kelso Ridge is the right skyline. Nearly to the summit, looking back down Kelso Ridge. 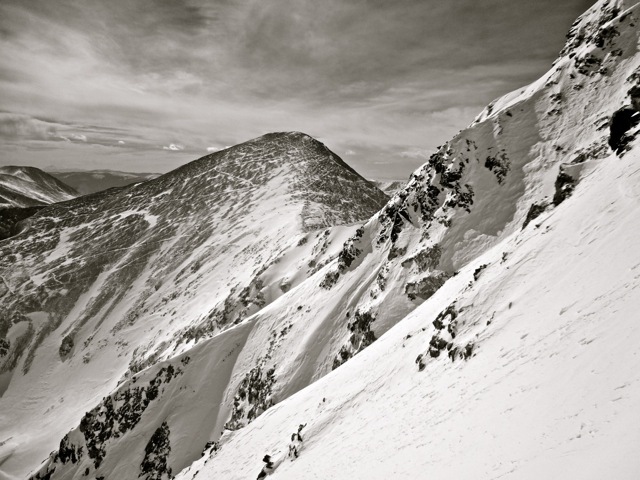 Grays Peak, from Kelso Ridge. Could use a drummer, but otherwise not bad.